I wanted to make a blog post addressing this topic, as it’s something that is discussed a lot, with a lot of pad brands. 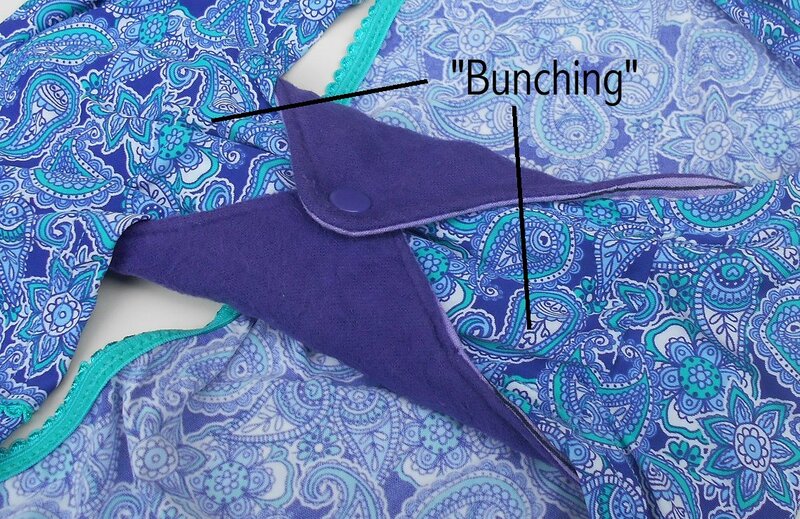 When people talk about cloth pads “bunching” they are generally meaning 1 of 2 things. 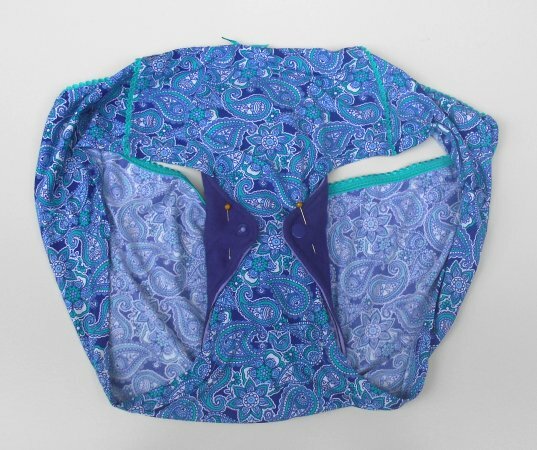 Either the back fabric of the pad “bunching”, or the pad “bunching” the underwear fabric when the pad is snapped onto the underwear. So first up, the pad itself “bunching”. 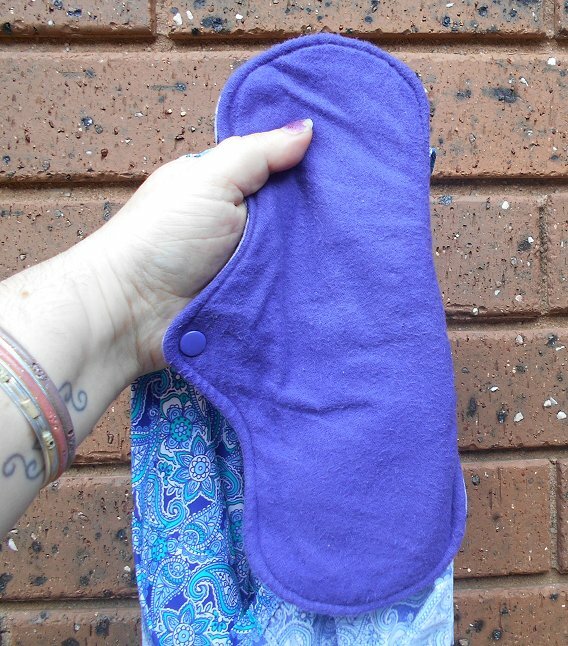 This happens with most pads – it’s not a sign of a pad being poorly made – it’s SCIENCE! 😀 Although different shaped wings and different fabrics will make this effect more/less obvious. As will the way you snap the pad closed. What is happening there? Well, think of it like a race track. You know how on an oval/circular race track, the people running on the outside lanes have to cover more distance to get around the track (which is why they stagger the lanes to make the distance each person travels even). Well, it’s the same sort of thing here. The topper and backing layers of a pad are the same size, so when the pad wings are folded around and snapped, the top layer is making a larger circle than the backing layer – so the excess fabric of the backing “bunches” a little. 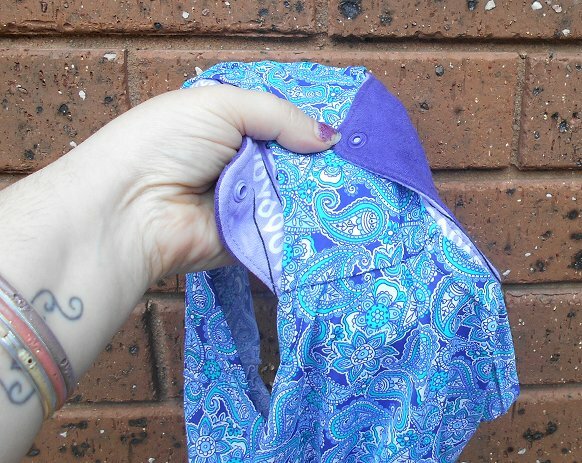 In this above photo both pads are made with the same pattern and the same amount of layers, but you can see the purple one on the left has more “bunching” than the blue on the right – that’s because the flannelette fabric on the purple one is a bit thicker than the cotton on the blue one. 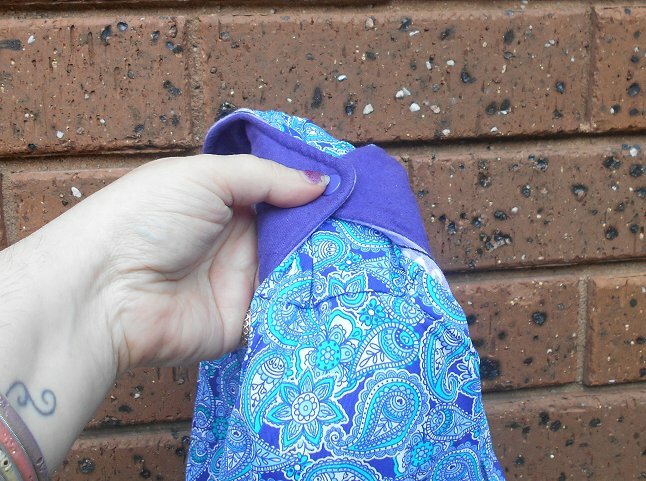 Thicker fabrics like fleece backing will have more “bunching” than thinner fabrics. Also each layer inside the pad will be a bit like the different lanes on a running track, so those layers will all “bunch” a little too, in varying amounts – so pads with PUL and hidden core layers will “bunch” more than pads that are just a top layer with core attached and a backing cotton layer. I have seen some padmakers argue that the “bunching” on the back actually gives better grip to the pads, which is likely true. The “bunching” effect gives more grippy fabric to the back and helps fill up the space to hold the pads securely. So really, while it may not look as pretty as you might expect a pad to look – it shouldn’t cause any problems with how the pad functions, and it’s just something that happens, because of the nature of multiple layers traveling in a circle. 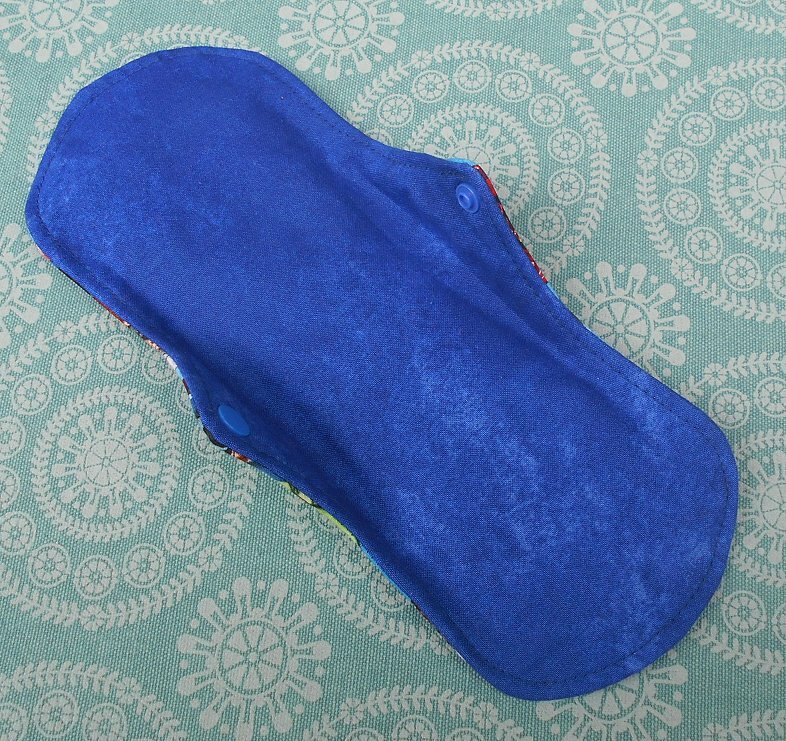 Now, not all pads do “bunch” like this…. It really depends on the shape of the wing. If the sides of the pad don’t curl around as much and the pad sits flatter, then there will be less (or no) “bunching”. 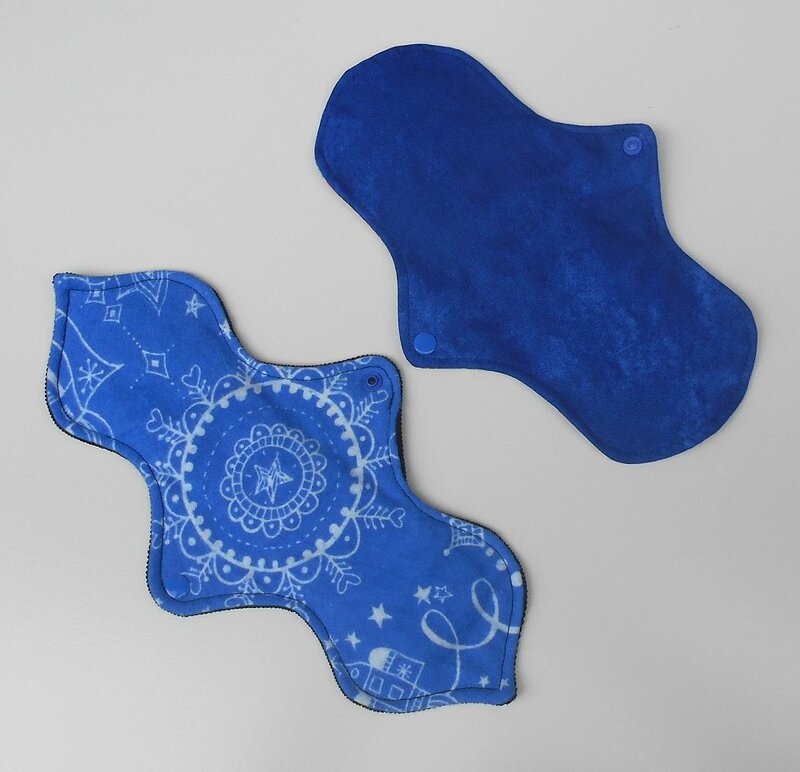 The pad on the left has a different shaped wing, allowing the back of the pad to sit flat so there is no real “bunching” on the back of the pad. However, it is worth noting that the disadvantage with wing shapes that are that they give less coverage through the crotch area. Below you can see the difference in the wing shape between these 2 pads. You can see the pad on the left has a narrow “tab” shaped wing, and provides side coverage only in the very centre of the crotch area. Whereas the pad on the right has a much wider coverage to prevent side leakage. It is also worth noting that while some people find the “tab” wing pads more comfortable to wear because there is less bulkyness through the crotch, they can also be more likely to slip sideways than a pad with wings that have more coverage – as the wider wings will hold the pad in place more easily. So that’s just down to personal preference. Wear what works for you. Now, just to address something some of you may be thinking – how come padmakers photos of pads don’t always show this “bunching”? Well, you can snap a pad closed so that the “bunching” effect is minimised, and obviously we like to make the pads look as nice as they can. So the way you snap the pads closed will affect the “bunching” you get too. 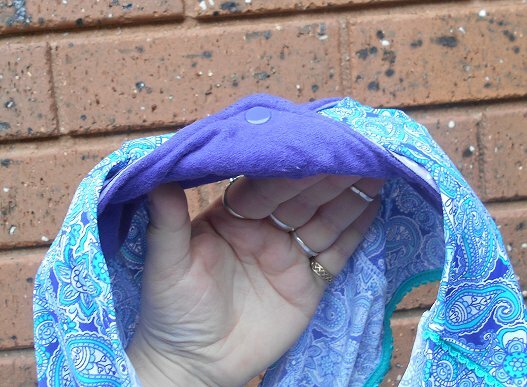 If you smooth down the back of the pad and find where the core section of the pad is, then fold the wings over from where the wing starts, you are making that backing fabric cover a greater distance than if you just grab it from the snaps and snap the pad closed. So when you snap your pads on, you might be just holding the pad by the snaps, and snap it around? Don’t do that – you’ll end up with a bunchy/lumpy/bulky terrible fit! Instead, hold the pad flat against your underpants with the wings out. Then fold the first wing over (like I showed on the blue pad above), then the other wing and snap together. 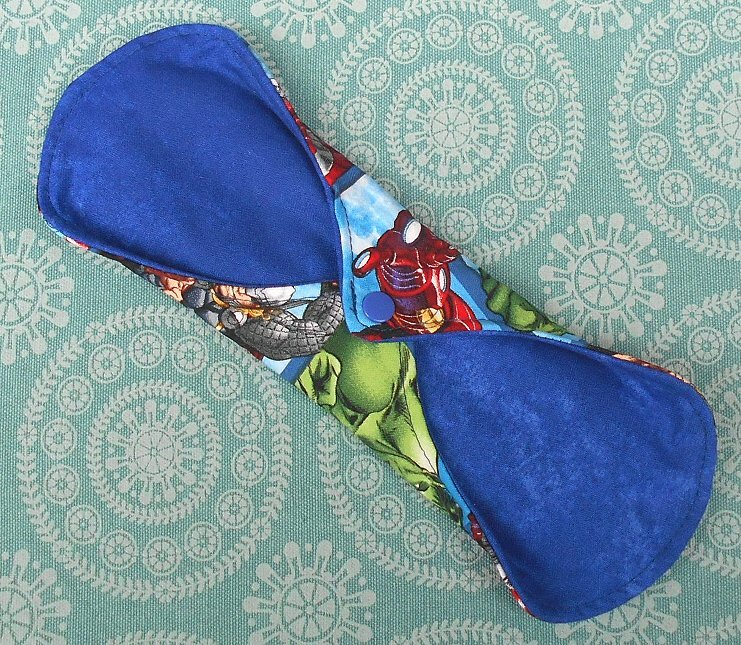 You’ll get a much flatter pad and better fit with less bunching! Now onto the other “bunching” issue….. Underpants! This happens when the fabric of your underpants “bunches” up after the pad has been snapped around it. 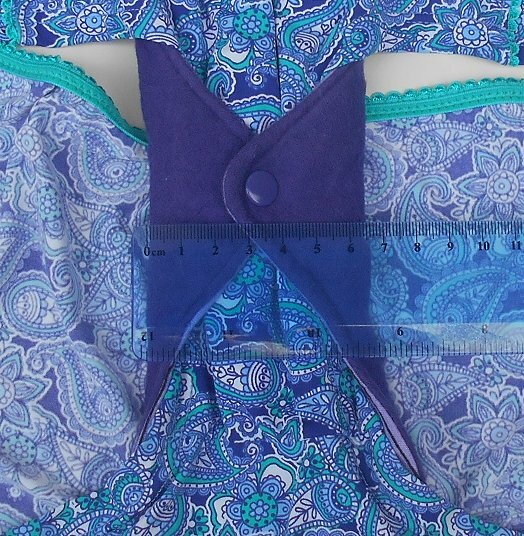 A bit hard to see in such patterned fabric, but hopefully you know what I’m talking about. 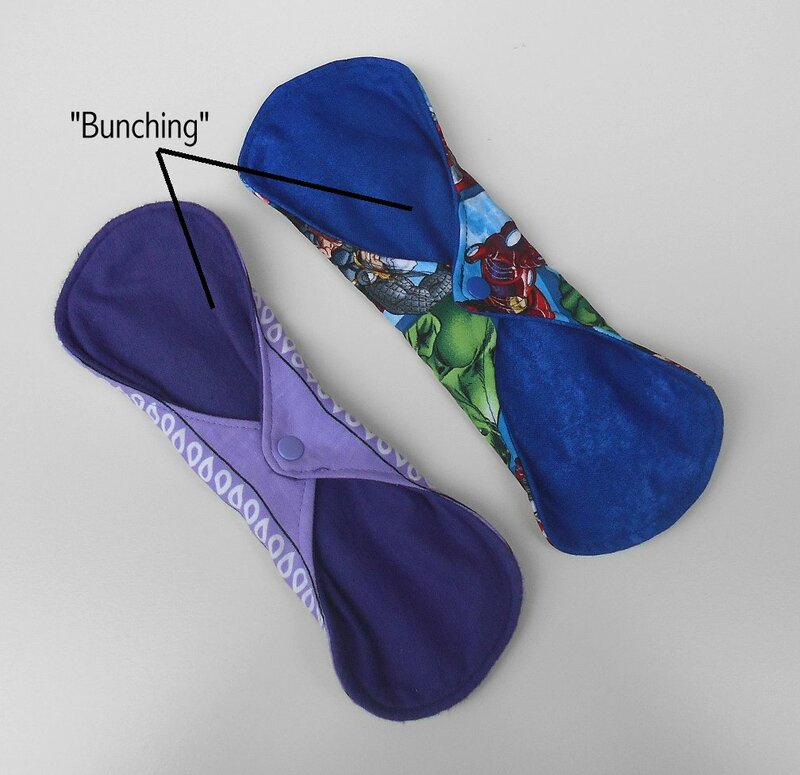 Some people feel that a pad “bunching” the crotch of the underpants means the pad is poorly made – but that is not true at all. This is simply when the fabric of the crotch of your underpants is wider than the pad you’re snapping around it. But you probably want this! 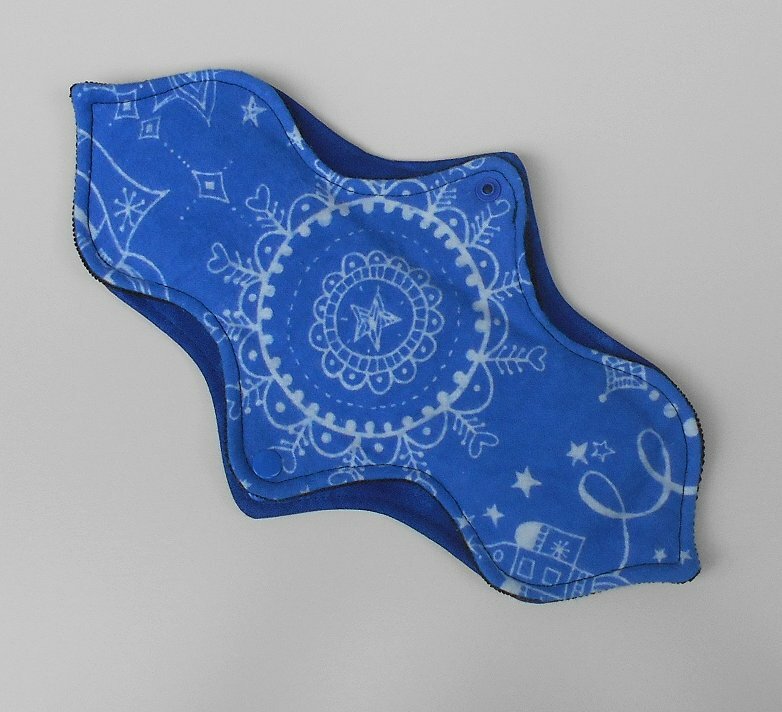 As it means your pad is snapping securely around the underpants and won’t slide around. The fabric should be able to flare back out again at the ends of the pad, so it shouldn’t cause any problems. You probably get fabric “bunching” in the underwear somewhere when wearing them without a pad too – because often there is more fabric than our bodyshape needs… but you won’t notice it when wearing them. Obviously it completely depends on the shape and width of your pads and underpants…. 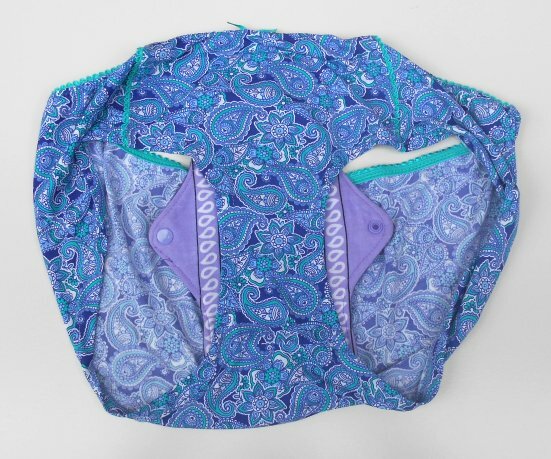 but unless you have pads made that exactly fit the shape of your underpants (and those underpants exactly suit your body), you’ll never find an exact perfect match for your underpants, often your underpants have to “bunch” a bit to fit the pad. Remembering that to get the best from your cloth pads, your underwear needs to be able to hold the pads securely against your body. So they should ideally be cotton (not as slippery as other fabrics), they should be tight enough fit and not baggy anywhere, and the crotch needs to be wide enough for your pads to snap around without them sliding. 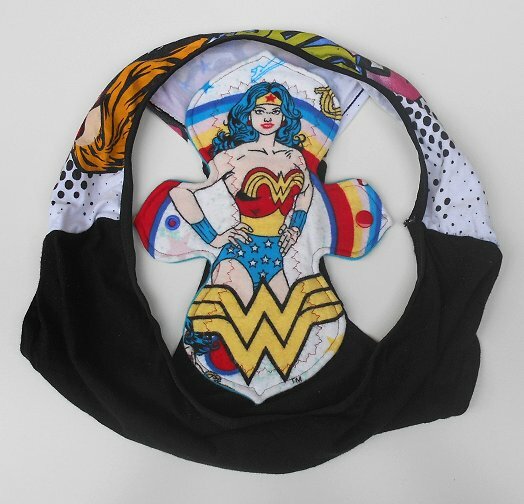 So often the best underpants for wearing with cloth pads, aren’t skimpy, and have more coverage. These underpants have a 7cm wide crotch. If the wings were to snap around so that the crotch fabric sits flat and doesn’t bunch at all…. The pad would end up being 8.5cm wide, and that would be uncomfortably wide for me. Snapping it normally, with the underpants fabric “bunching”, it’s a nice comfortable 6.5cm wide. When wearing them, I don’t even feel the “bunching” of the underpants. 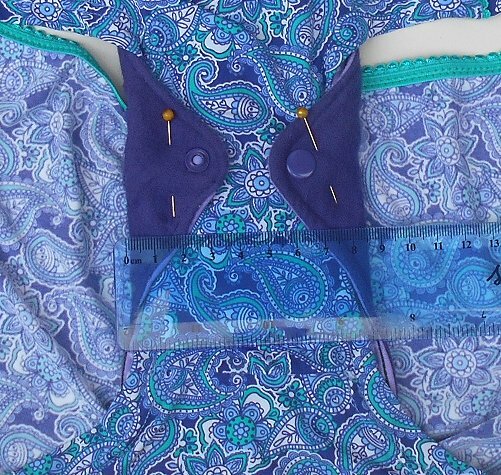 Again, the shape of wing can also affect this form of “bunching” too – narrower “tab” wing pads cover less of the crotch, so don’t cause as much fabric bunching. This next underwear is 7.5cm through the crotch with a pad that snaps to 6cm. So if this was a wider wing pad with the same snapped width, there would be more “bunching” than the pad above, but it barely has any “bunching” at all because of the shape of the wing. Now…. 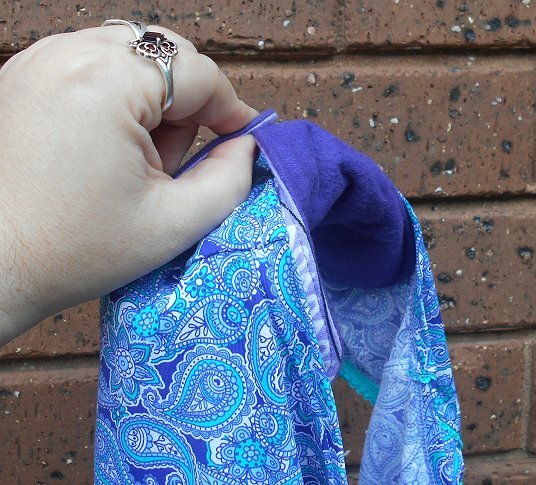 (Other than in Boyleg styles) Too much fabric is the crotch is usually MUCH better than not enough….. You don’t want to use cloth pads with underpants that have a crotch that is much narrower than the pads. 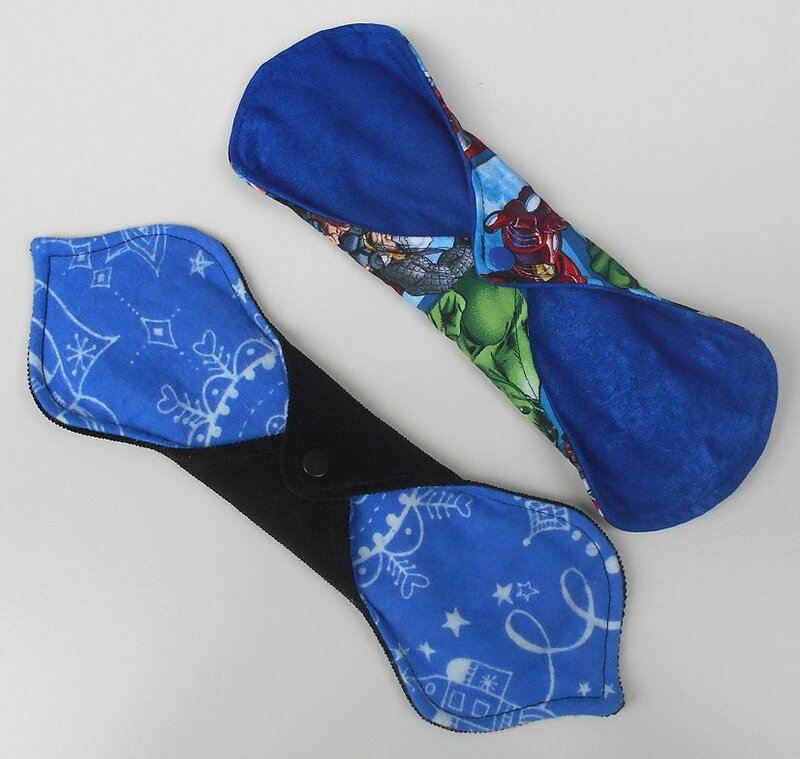 Or else the pads won’t snap snugly enough around the crotch, and you could find the pad slides around sideways (as in it spins around and you have it sitting sideways, or the snaps against you! It happens!!). 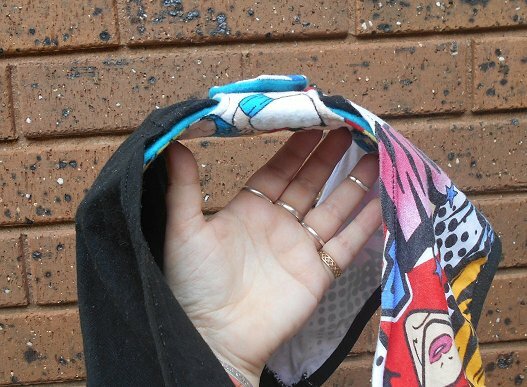 Your underpants need to be fairly substantial to hold the pads securely in place! 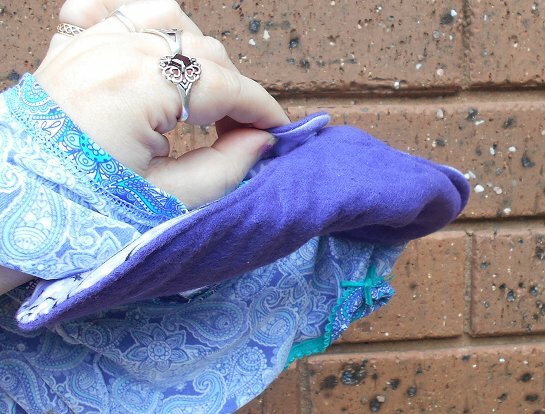 Be wary of underpants with lacy edging too, as that edging isn’t really going to do much to hold the pad in place, so basically it’s just the fabric part that is holding the pad, which is generally pretty narrow. These underpants have 3cm of fabric in the crotch, so they really are not suitable for using with a standard width pad. You would need very narrow pads to wear with these underpants – but you’re probably better off wearing wider underpants! So hopefully that clears up some of the “bunching” issues. Neither are really a problem, it’s just what pads do!